At last here is Daevid's visionary history of the early years of Gong. Written and completed in 1994, it waited fourteen years for the appropriate graphic designer who arrived in the person of Stefanie Petrik in 2008. GONG DREAMING 2 is Daevid's take on the personal dramas and esoteric forces at work behind the scenes during the classic Gong period. It starts in a Parisian studio during the recording of the Magick Brother/Mystic Sister LP for BYG records, continues through the first UK tours and Gong Trilogy years with Virgin Records in London and climaxes with Daevid's extra-ordinary departure in 1975. 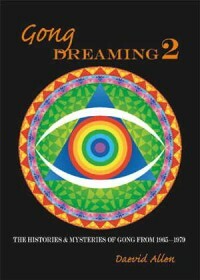 Four times the size of Gong Dreaming One and ten times as contraversial and eye opening, it includes a huge number of images as well as graphic descriptions of the spiritual visions that guided the early development of Gong. Gilli Smyth, Pip Pyle and Mike Howlett..
published by SAF London - available from www.planetgong.co.uk.